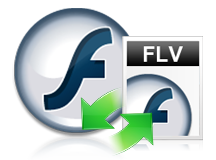 FLV files are also referred to as the Flash Video files. Although originally created by Macromedia, the file format was developed and perfected by Adobe Systems. It is primarily intended for use with the Adobe Flash player. FLV files are very popular over the internet, especially for online videos and animations. FLV files are widely used by the most popular video sharing sites such as YouTube, Vevo, Hulu, and MetaCafe, among others. SWF files, which is another file format created by Adobe, can be integrated into FLV files as well, as they are encoded in the similar manner. Wanna to import FLV files for editing or burning, but your video editor or DVD burner don't let you do it? Here we will provide useful tips to help you solve the problem. The quality and file size of a FLV file is determined by the codec that is used rather than the FLV container itself. FLV format files are able to contain a number of different codecs. These are Sorenson, VP6, Screen Video, H.263, MPEG-4, and AVC. However it is important to consider the codecs with which they are not compatible. Specifically, while FLV files are compatible with the H.263 video standard, they aren't fully compatible with H.264 (even though they are able to contain H.264). The importance of this is that the H.263 codec handles standard definition video, while the H.264 codec handles high definition video. There is no way to use FLV to properly stream high definition video.